Sometimes, when you’re bleeding to death, a blood transfusion is not an option. A mother injured during an earthquake in California needs a blood transfusion — along with hundreds of other victims. A soldier in an austere environment with no ready access to a blood bank has just lost a leg. A chronic anemia sufferer is in the middle of a sickle cell crisis, but she’s been transfused so many times that her body produces antibodies that attack any new blood. In dire situations like these, there is a blood alternative with the potential to save these patients’ lives: Hemopure. Hemopure is a bovine hemoglobin-based oxygen-carrying solution, and UF Health now has access to it. Bruce Spiess, MD, has just been named the official southeast regional contact point for the distribution of Hemopure. Dr. Spiess is one of the leading advocates for oxygen therapeutics in the United States. He authored Perioperative Transfusion Medicine, the largest textbook available regarding transfusion issues in surgery. Last year, he presented information about these products to government leaders at a meeting for the U.S. military’s Combat Casualty Care Research Program at Fort Detrick, Maryland. His new appointment means that he is now responsible for helping clinicians contact HbO2 Therapeutics, the drug’s manufacturer, so their patients may be evaluated to determine if they qualify for treatment with Hemopure. Hemopure will play an important role in UF’s expanding blood management program. The program, led by the Department of Anesthesiology in conjunction with the Transfusion Committee and the UF Health Blood Bank and Transfusion Service, aims to encourage the judicious and appropriate use of blood transfusion. The goal of this program is to promote awareness of the excessive use of blood transfusion and to consequently reduce the number of blood transfusions patients receive. Medicine has a need for a more focused approach to blood transfusion, Dr. Spiess explained — up to 60% of blood transfusions are considered unnecessary, and blood transfusion can have long-term negative consequences. The program will help care providers explore every alternative to blood transfusion, including Hemopure. Hemopure, the only drug available in the United States that can act as a bridge while the body regenerates blood, gives UF Health more flexibility in treating these patients. “It’s just another avenue we can offer to people who have life-threatening anemia,” said Mary Jane Michael, RN, BSN, MS, Dr. Spiess’s research manager. 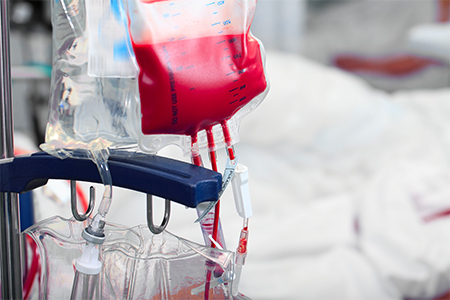 Blood transfusion carries both known and unknown risks, and the blood supply is dwindling. It is also costly: One bag of blood can cost the hospital $200, and the cost to the patient can reach up to $2000 because of the associated costs of supplies, personnel, testing, and regulatory measures. This cost does not take into account the risks of transfusion. Transfusing blood into a patient whose body cannot accept it can result in further organ damage and long-term immunocompromisation. One population that will benefit from the expansion of the blood management program is Jehovah’s Witnesses. UF Health’s Jehovah’s Witness program, running parallel to the blood management program, is intended to facilitate bloodless medicine techniques that can be applied to all patients. Dr. Spiess said UF Health is implementing infrastructure and personnel to help the hospital accommodate care for Jehovah’s Witnesses. According to Michael, who was recently involved in rewriting the regulatory oversight protocol to obtain expanded access to the Hemopure, previously, the the treating physician had to make a series of phone calls before being granted permission to use the drug and then had to wait until the product was shipped to the hospital to administer it. The hospital is now able to stock a small supply of the drug in blood banks, which makes it more easily accessible in an emergency. It does not serve as a perfect blood substitute, Michael said, but rather should be used as a bridge to provide the patient time while the body generates more red blood cells. Although it has many advantages over blood — unlike blood, it doesn’t need to be refrigerated, it lasts for 3 years versus 48 days, and it doesn’t have to be cross-matched and typed with patient blood — it can also be risky. Some risks include volume overload and blood clotting, which can result in complications such as heart attack and stroke. “That’s why it was important for us to write this protocol and get all the steps down clearly,” Michael said. At UF, development of the treatment protocol was led by Marc S. Zumberg, MD, Professor of Medicine in the Department of Hematology and chair of the Transfusion Committee at UF Health, who has successfully treated multiple patients with Hemopure. The protocol outlines the FDA criteria for use: the team must have exhausted all other possibilities, the patient must have life-threatening anemia, and there must be a hematology consult. When the patient is likely to die without an intervention and blood transfusion is not possible, data show that the benefits of using Hemopure may outweigh its risk, Michael said. Because it is in its experimental stages, the drug is only available under investigational status through the FDA expanded access program to qualifying patients under specific circumstances. To use it, U.S. institutions must get approval from HbO2 Therapeutics, the local Human Safety Institutional Review Board, and the US Food & Drug Administration. The institution and the treating physician must follow a specific treatment protocol, and they must submit an Investigational New Drug form agreeing to physician accountability and use of the drug in accordance with the treatment protocol. Going forward, Dr. Spiess’s team will seek long-term FDA approval for expanded access to the drug. The department will also continue to expand its blood management and Jehovah’s Witness programs.